Get your soil screened for free at Frogtown Farm! Frogtown Farm will have on-site soil screening for lead available on Saturday, June 23, 2018 from 10:00am to 1:00pm. As part of the Soil Kitchen-Twin Cities project, faculty and students from the UMN Dept. of Soil, Water and Climate are bringing equipment that will screen soil samples for lead. 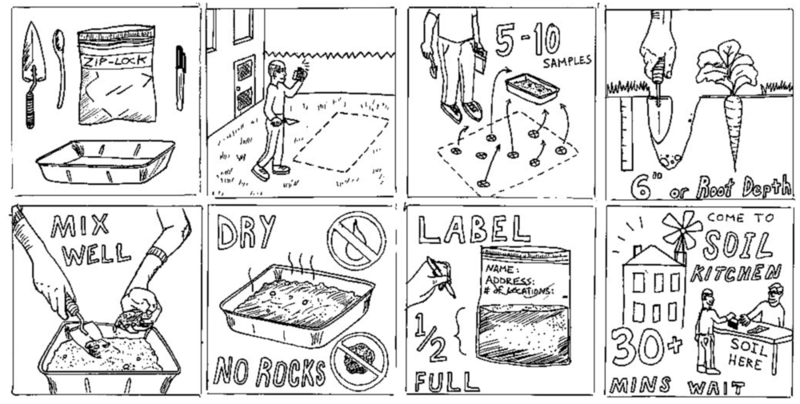 In order to take advantage of this opportunity, please bring a dry, composite sample from your prospective or existing garden space in an open, Ziploc bag to the event (see diagram). The analysis requires a sample of 2 cups of soil or more. Choose 3-5 locations scattered within your area of interest (i.e. front lawn, back lawn, vegetable garden). Composite samples can be taken from garden spaces/growing spaces. If you want to do lead screening specifically around past or current buildings, or where cars were parked, then consider bringing a separate composite sample for that. Put 2 cups of your mixed soil sample into a plastic bag. Bring your sample and if you are submitting more than one sample you may use a code to identify each sample for your own information. Multiple samples will be accommodated if space and time allows. Bring it to the market on Saturday, June 23 and learn about your soil!